Xiaoyanta known as Little Wild Goose Pagoda ( or simply Small Goose ) is located to the south of the walled Xian city on the grounds of the Felicity Temple. 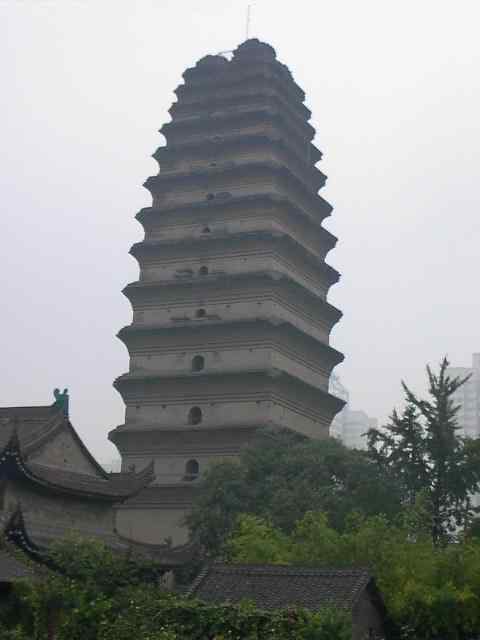 This structure gets its name because it is smaller than the Big Wild Goose Pagoda, although it is more stories high. It was completed in 709 A.D., when Buddhism was firmly established in China. Small Wild Goose Pagoda housed Buddhist scriptures brought back from India. The top of the 13-storey pagoda was shaken off by an earthquake in the middle of the 16th century, but the rest of the structure remains intact. Above the arched doorways on the first tier are Tang engravings of ivy designs and Buddhist figures. The pagoda is part of a temple complex and monastery.